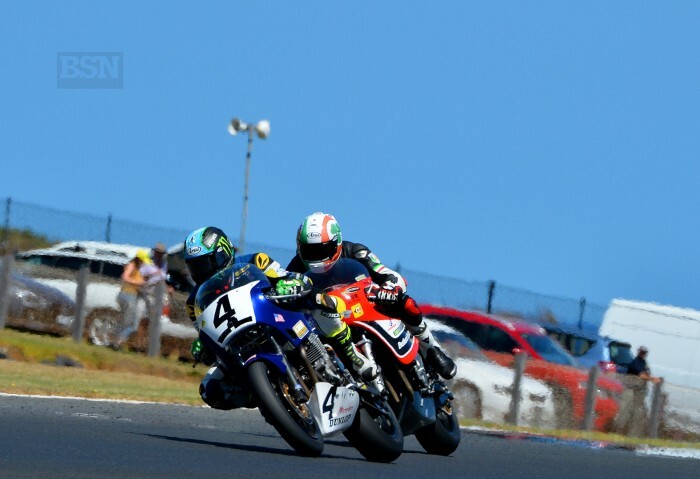 Every outing, every lap seems as if Josh Hayes is just getting faster and faster as the weekend goes on at the 26th running of the International Island Classic and this was proven in the first two races of the weekend today. After qualifying in sixth, with a 1min38.202, the Californian rider today converted it into a solid 3-4 result which sees him setting in second place in the individual honours, five points behind Aussie rider Aaron Morris. While Hayes is a racer at heart, he openly admitted to Bikesportnews.com that watching Morris ride today that he can say that doesn’t quite want it as bad as what Morris wants it. At the end of the day Hayes just wants to be smart in the races. The opening race went really well for the former four times AMA Superbike Champion, considering what happened to both Jason Pridmore and Beau Beaton. The second part of race one was actually quite tough for Hayes, as he had the vison of Pridmore in his mind. In race two, well, that had its highs and lows. The opening lap was good for Hayes, as he snared the holeshot and lead for the first lap, which Hayes described as “fantastic.” However, his Yamaha FJ 1250 was cutting out on him on the first lap. Luck is it and luck has it, Hayes got lucky that he had a big enough of a gap to Alex Phillis which enabled him to come home in fourth place. This has well and truly kept Hayes in the running for the Ken Wootton Perpetual Trophy and of course, the American team, as they are just fifteen points off Australia’s lead in the Team Points award. Those improvements were simply just a brake pad material change which helped stopped the bike a bit better. On top of that was a gearing change which got the bike slowed down in the slower parts of the track. “It was really hard to get a feel for the sound, as these bikes are a little bit different. I think I was shifting in some wrong parts of the track. I changed up the gearing to help me get slowed down in the slow corners and it still seems like to be reeving out OK. I think we’ll probably just leave it alone and ride it as it is now and try and have a good two remaining races tomorrow,” finished Hayes.